Copyright Peter Mauss, No usage without permission. Approaching the site of Diamond Mines, you see a stone wall, but it's not a stone wall. Surprise, fantasy, a cliche turned on its head is what I expect from a work by Dan Snow: unimaginable beauty conjured out of stone. 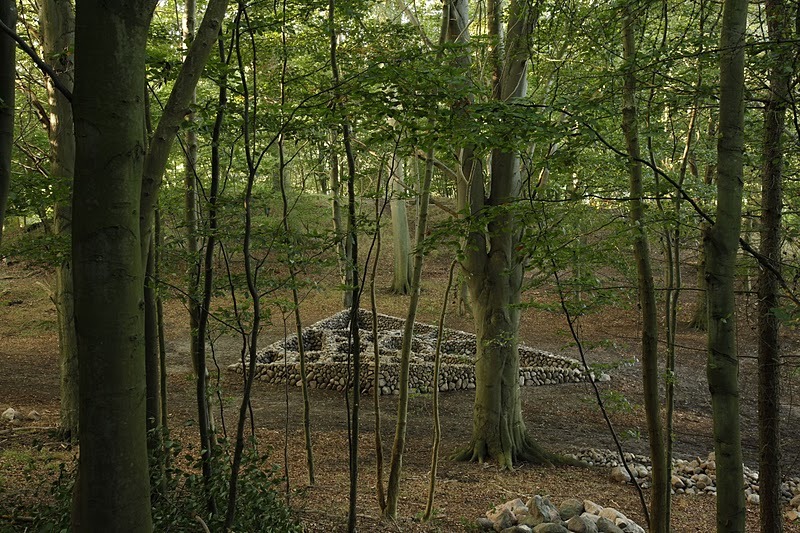 Diamond Mines is set in a beech grove about 1/2 mile walk through a woodland in Tranekaer, Denmark (TICKON Sculpture Park). Among the vertical trunks of the trees and the fluctuating canopy of branches that filter the sunlight, the trapezoidal shape of Diamond Mines is a stark contrast. The frame adheres to a strict geometry, while the inside appears random. The inside spaces or cells resonate. They captivate in the same way a spider web is endlessly fascinating. 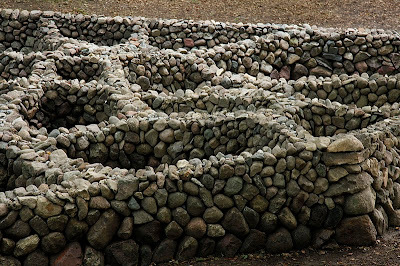 They might be burial plots or spaces for ceremonial objects or abstract forms. I enjoyed the endless mystery surrounding the piece. 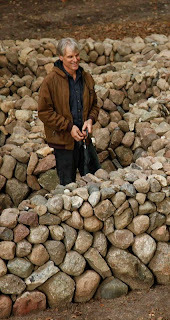 What I was walling in or walling out,"
I don't know what Dan Snow asks himself about what he is walling in or walling out. 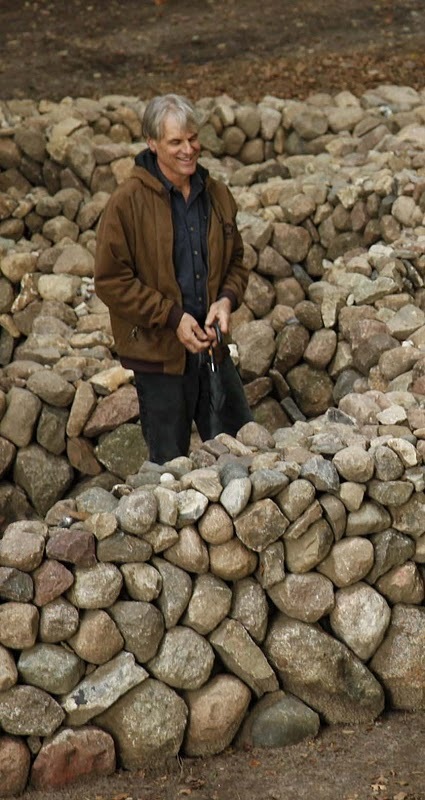 I feel confident in saying he considers how a pile of ordinary stones can make a work of art. And for me, he succeeds in that intention. 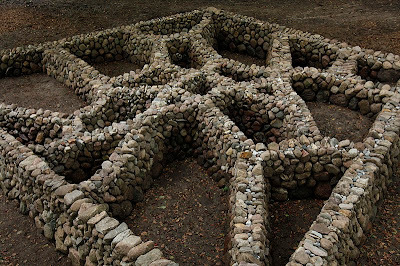 When I heard about Tickon, I imagined a place like Storm King in Upstate New York. A sculpture park with large pieces spread out over the landscape surrounded by parkland. Tickon has nothing in common with Storm King. It is a wild place. Unlike, the Danish landscape which is tidy, Tickon's heart is in the unfettered, open, and raw environment. When I mentioned Tickon to a few Danes, each one made a particular point of talking about its setting. The lack of cultivation and minimal tending. It's a very unique Danish landscape. "Tranekaer International Centre for Art and Nature is situated in the park around Tranekaer Castle. The landscape-garden was put at disposal of the Center by Count Preben Ahlefeldt-Laurvig in 1990. 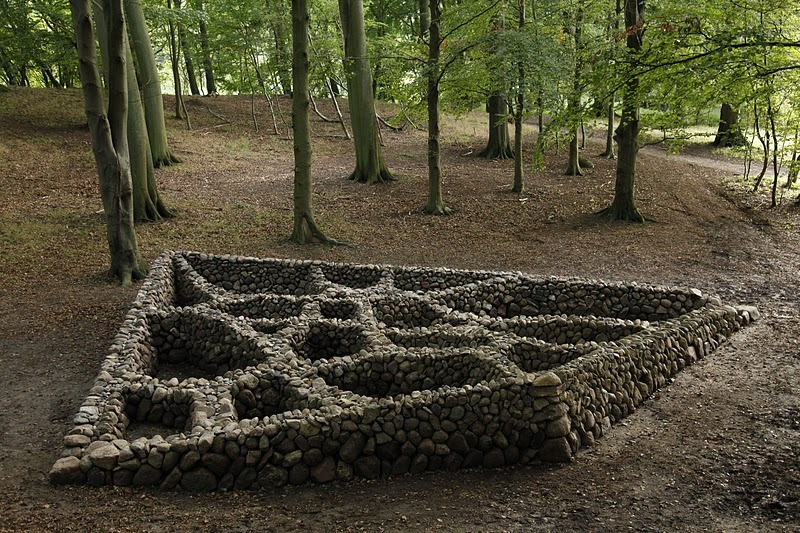 TICKON opened in the Slotspark in 1993 with 14 works by Danish and international artists. 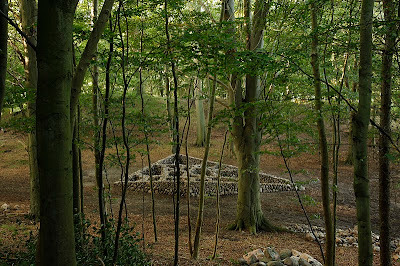 Artists who create installations of structures in a forest or fields are presenting a gift to the landscape. The work cannot be moved, sold or any other way absorbed into the system. The artists must take weather and the changing seasons into account and the fate of each individual work is calling for continuous evaluation. Introducing a work of art into nature is a way of making people notice the cycle of growth, struggle and decay. 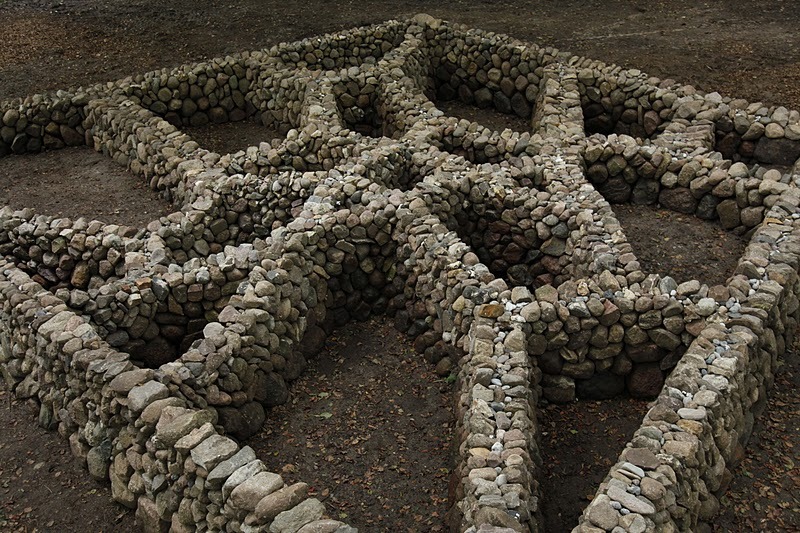 The order of nature is a lack of order - and man-created works of art are part of this cycle. Most of the artists working of TICKON see their role in an ecological and social perspective with transience being an integral part of the idea behind the works." from the brochure published by TICKON. PLEASE NOTE: All photos on this blog called A Diamond in the Rough: Dan Snow are copyright Peter Mauss. All photographs of Dan Snow's work, Diamond Mines is original, copyrighted property of Peter Mauss and may not be reposted, reproduced or used in any way without prior written consent. 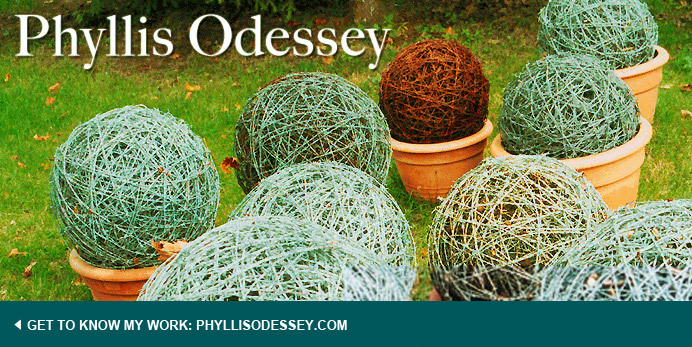 Please contact Phyllis Odessey for permission. We appreciate your cooperation.